We should have 4 in stock. Need more? It usually takes us 7 - 10 days to bring more in. 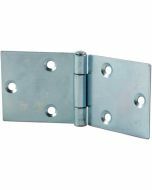 Hinges are generally used as an aid in attaching scenery flats. Three types are available. 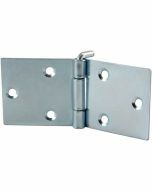 This is the Sure Hinge which is a special type of loose pin hinge with interchangeable halves. It is scored so you can bend it around nominal 1" lumber. 1.42" x 2.25" x 6"